Nintendo Land is going to be played by a lot of Wii U owners, which we know thanks to pre-orders for the system's Premium Set being practically sold out in the U.S., for example. We were able to try a number of its titles in a post-E3 London event, where we gave you first impressions of Nintendo Land's multiplayer games, and this week we were able to try more of the mini-games on offer at Nintendo of Europe, and it's clear to us that it will have plenty to offer Wii U gamers on day one. Mario Chase, without a doubt, was both the simplest and most outrageously fun game we played in a full day of trying out Wii U launch titles. It's difficult to explain why it's so much fun, but we'll do our best to show you how a simple game of chase can be an absolute riot. The premise, as you no doubt know, is incredibly basic. One player uses the GamePad exclusively as a Mii dressed as Mario, and when the game starts they have 10 seconds to makes a run for it from four Mii toads. 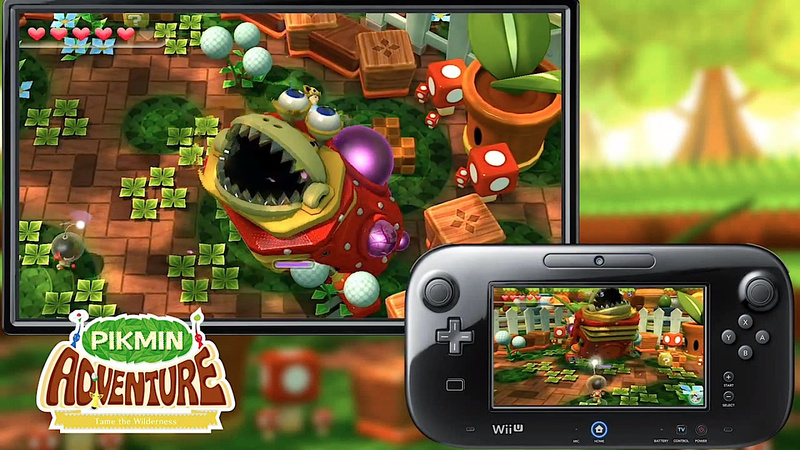 The GamePad screen shows you a top-down view as you run with the left stick, and also a map so that you can see the pursuing toads. Mario Mii has all of the best cards, in that respect, knowing exactly what the others are doing and having the ability to run across and destroy bridges over sticky mud, or even grab a star power up for a spell of invincibility and super speed. The only task is to survive for a few minutes. For the toads, each using a sideways Wii remote, their advantage is a slightly faster run than Mario and the strength of teamwork. Each area of the split-screen has an indicator saying how close you are to the target, though no idea which direction to follow. The best tactic for the toads is to use that guide and try to spot Mario in one of the four colour coded areas; what ensues is a lot of communication along the lines of "I think he's in blue" or "nah, he might be in yellow". Once someone spots Mario, it truly kicks off, as the four players tell each other where he is and the chase starts in earnest. All Mario can do is run his legs off, and the sight of four toads in pursuit had us and the other players laughing and shouting like we were six years old all over again. With four players on the chase and trying to tackle Mario, it's ripe for slapstick moments of accidentally tackling each other and confusion if Mario Mii gives them the slip. The fact that you can see the panicked face of the Mario player courtesy of the GamePad's inner-facing camera just adds another piece of humour. 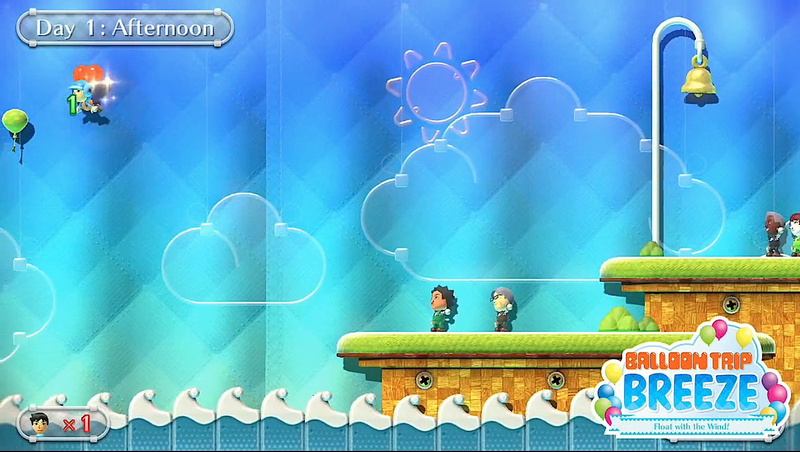 Mario Chase couldn't be simpler: it's hide and seek combined with chase, wrapped in super-cute visuals and animations. If you can find four friends to play with this is ridiculously fun to play, its level of enjoyment way beyond the basic concept. It's a winner. With Pikmin 3 not quite making it in time for the launch of Wii U, fans of the GameCube series will be able to get an early, simple fix in Nintendo Land. What this game offers is a stripped down, action-intensive interpretation of the series, while keeping enough of the basic ideas in place to make it a lot of fun for fans and newcomers alike. On the one hand the levels in Pikmin Adventure, which task you with helping Olimar escape to his ship, provide a degree of puzzle solving and limited exploration that works well in a mini-game. At the same time, much of the play is a basic task of running around and bashing everything, whether blocks or enemies, into pieces. The main player controls Olimar on the GamePad and has the ability to hurl mini Pikmin by aiming with the stylus on the touch screen, while also calling the bigger Pikmin with a whistle or even throwing them wherever you want. Extra players control these larger Pikmin on the TV with a sideways Wii remote, and basically run around attacking anything that moves, or even things that don't. The areas are reasonably large and the visuals are extremely bright and colourful, with boss creatures and bugs having plenty of charm. It's clear that the GamePad player with Olimar is well and truly in control, so if you give that character to a gamer who doesn't know what they're doing doom may await. It's plenty of fun, however, and there also appears to be basic levelling up available for characters by collecting nectar, suggesting that this may be a mini-game to sit and play over a longer period. Metroid Blast was easily the most complicated multiplayer offering on show, making this a game that certainly won't suit all-comers. Whether in co-op or competitive multiplayer, one uses the GamePad to fly Samus' ship while two others use a Wii Remote and Nunchuk to control Samus Mii characters on the ground. For those on the ground, the controls are instinctive and effective if you're an experienced gamer. Adopting a third-person shooting perspective, aiming with the Wii Remote and firing with B is natural while you hold A, briefly, to swivel the camera. Holding Z to go into a morph ball will give Metroid aficionados a kick, while a shake of the Remote is a useful dodge move; these ground-based controls feel natural. We can't say the same for the ship controls on the Wii U's new controller, which are rather complex and awkward in the context of a Nintendo Land mini-game. Using the right stick for height, the left stick for navigating the ship and the the built-in gyroscope to aim on the GamePad screen may not sound too onerous, but in the heat of a battle it can feel as if the odds are stacked against the ship and all the strength is on the ground. The imbalance between ground and ship controls matters less in the co-op mode, where you take on waves of enemies within an arena, working together to fight them off and release health boosts. In competitive multiplayer, it was two ground-based players in a team against the ship and we didn't successfully win, or see anyone else win, when playing in the air on the GamePad. Although you have a greater view of the ground and plenty of firepower, the difficult controls and clunky mobility saw the Samus Mii's easily avoiding fire and successfully sniping from below. All in all, this was the weakest of the Nintendo Land games on display. It's not bad, by any means, but the relative complexity of the ship controls and an imbalance in competitive multiplayer let it down. This was the only single-player only Nintendo Land game on show, and it was a pleasant surprise. While a re-imagining of Balloon Fight's "Balloon Race" mode wouldn't have been high on many people's lists, the side-scrolling stages that we saw were perfect for those familiarising themselves with the GamePad's touch screen. In fact, this felt in some ways like a light, entertaining DS game, blown up into some pretty visuals that, like some other parts of Nintendo Land, have an art style similar to Kirby's Epic Yarn. Your task is to swipe the stylus on the touch screen to produce gusts of wind, directing your balloon-flying Mii to grab balloons, bubbles and to take out enemies by landing on top of them. The six individual minute-long stages on show followed on naturally as morning, afternoon and evening of two separate days. They got a lot harder as we progressed, with strong wind bringing more frenetic swipes into play, and a lot of deadly obstacles to avoid or, if you have the skill, quickly destroy with a tap on the GamePad screen's zoomed-in perspective. It's a simple experience, so its value in the package will depend on how many levels and stamps — which seem like achievement-based unlockables in all of the games — are available to play or earn. As a fun diversion when you're playing solo, however, it's an enjoyable experience with controls that will feel familiar to DS handheld veterans. Also on show was The Legend of Zelda: Battle Quest, which we've covered in our first impressions of Nintendo Land's multiplayer games. While Mario Chase was a particular stand out, the Nintendo Land package is shaping up to feature a number of enjoyable mini-games, even if some like Metroid Blast are likely to baffle inexperienced gamers. 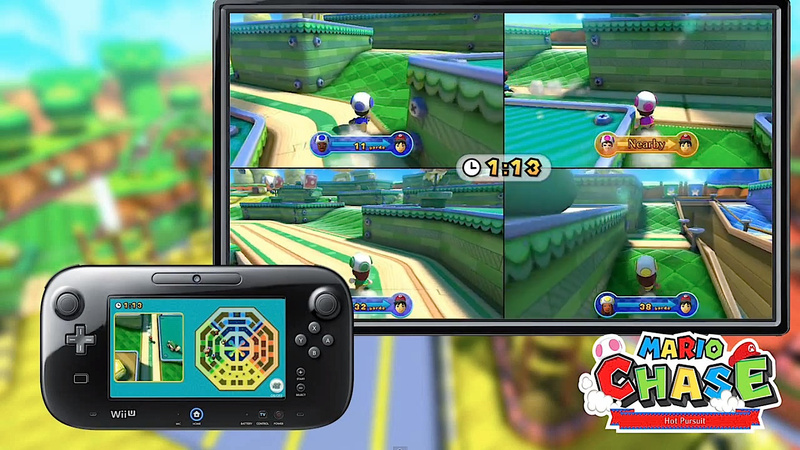 While Wii Sports was a natural way to show off the Wii Remote and Nunchuk, this seems to be an equally effective way to show off the Wii U GamePad, particularly demonstrating the fun to be had in asynchronous multiplayer. I still can't find any decent information on F-Zero's part of this game. I'm sure time will take care of that. These sounds like a lot of fun as is, tough. everything you say in the article is more proof that ninty should include a copy of the game with every console sold. it needs to be bundled to give players that 'wow' moment that will make them able to use word of mouth to those who a unaware of the capabilities of the WiiU. Mario Chase would be really awesome if it had Online play, With Anyone! For some reason, there's nothing quite like a good game of hide-and-seek and the thrill of being chased! I just need to save up the money... Can't wait to play it with my younger siblings! I am happy that there's a single player Balloon Fight attraction though. Sounds like fun. Glad I'm getting it as a pack-in game. I'm gonna enjoy this. can wiiU play dvds or bluray or divx or xvid or mp4 or avi's? @k8sMum: I agree. The should sell 32GB white or black with nintendoland included and an extra pack wich includes for exaple zombi u.
Nintendoland is more a showcase of console abilities than a real game. I still can't believe there's not a Star Fox minigame. Oh, well. I can't wait to play it anyway. Just like Wii Sports (and Resort), this seems like the type of game that I'll come back to again and again anytime I'm playing with friends or family. This game is looking more and more fun over time. I'm excited for it! Still wondering what Yoshi's game will be like. Judging by the name though it sounds to me like you'll have to race around in a cart and collect fruit. But yeah, I'm looking forward to all the games in this package! Looks fun. I hope there's options for 2-player games. As I doubt I'll have 5 people around to play this. You didn't mention it but I'm guessing all the asynchronous games can be played solo on the gamepad? I hope they've come up with an easy way to synchronize the Wiimotes to the WiiU and back again. Whenever we take our Wiimotes to my parents or sisters (they each only have 2) it's always a hassle there and when we get back home. And don't ask my mother or sister to synchronize them, ain't gonna happen. 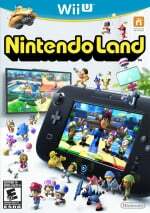 "Nintendo Land is going to be played by a lot of Wii U owners, which we know thanks to pre-orders for the system's Premium Set being practically sold out in the U.S., for example." I think instead of "played" you meant "traded in". cant wait for details on yoshi's fruit cart! This game looks awesome, but I can never get enough people at the same place and the same time to take advantage of the five player games! My friends all of jobs, significant others and lives. Man I wish this game was playable online! this game looks like super smash bros. party! Shame I got nobody to play this with and it doesn`t look very fun once you`re by yourself.However still looks like loads of fun for parties. Still,pass I`ll pass on this one. I feel sorry for people who don't have others to enjoy these games with. Surely you can rope together 4 friends on the occasional weekend? Despite having some to play it with, I still hope there are online options for some of these games. I've almost got enough money saved up, but I'm worried if there will be any Deluxe models left by the time I have enough. Luckily, most of the people in my town play Xbox, so I'm counting on my local Gamestop to have pre-orders still available. I wonder what the two unconfirmed ones are. I cannot wait till it is released!!!!!!! I hope the rest of the games keep a strong variety we have seen so far, which is what they need to do to get people interested. This game is looking better by the day. I'm actually pretty stoked to play it day 1. I hate you Nintendo...I'm such a sucker for your crazy antics! I'm sure I read somewhere years ago that Shigsy had an idea for a hide & seek game for the Wii. Anyone remember? No Nintendoland for me. Nice game to have included in the package but not buying it seperate. I had ordered the package with Nintendoland but Nintendo can't deliver enough of it so my store offered me a WiiU with ZombieU. Not really interested in that game but I get a pro controller in the package as well and its cheaper then when I have to buy the controller as an extra. You say that the balloon game is the only "single player only" game of the set, are most if not all of the other games at least available as single player even if that is not the optimal way to play? can you play the games with the wiiU gamepad pro other than the nunchuk ? i dont own a Wii, so i dont have nunchuks and wiimote. buying the system would mean i need to add around 80$ but another gamepad. thats a lot. i would prefer the wiiU gamepad pro at 49.99. Man, that mechanical bulborb is freaking scary! But anyway, this all looks quite fun. Is there a pokemon attraction yet? Do you need 5 people to play Mario Chase? Just wondering, because I don't think I can round up 5 people to play virtual tag with me. Well, it's a good thing this is coming with the Premium Set, cause otherwise I wouldn't buy it, but I do want to try it out. So I'll be messing around with it all. I haven't really looked into the minigames we know about so far, because I've been too caught up in stacking Skylanders news. OH COME ON! METROID BLAST SOUNDS ONLY A LITTLE HARD! THE WEAKEST? WEAKEST!? ARRRGGG! The controls weren't quite like I expected..... BUT WHO CARES? 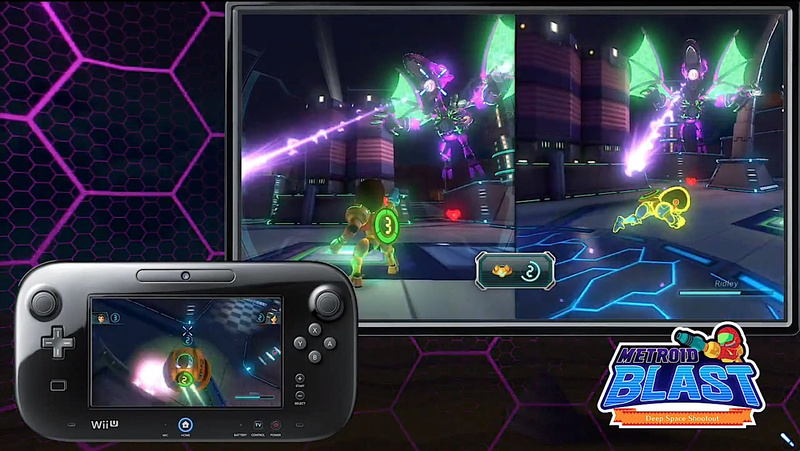 LIKE COMMENT #1 SAID, METROID BLAST DOES LOOK LIKE THE FUNNEST. I WAITED LONG FOR A METROID GAME (Yes, two years does count as long) AND DO NOT WANT YOU TO RUIN THAT!